Mark Hambourg shared several commonalities with his younger friend (and fellow Savage Club member and bridge partner), Benno Moiseiwitsch. Both were pianists in the grand Romantic tradition who came from Russian territory, settled in England, and recorded extensively for HMV from the acoustic period onward (where they were both relegated to the cheaper black – later plum – label releases reserved for popular domestic artists). Their repertoire overlapped a good deal; indeed, both of them recorded the Beethoven C Minor concerto with Sargent (who also set it down on disc with another Leschetizky pupil, Artur Schnabel). But while Moiseiwitsch has remained familiar to record collectors over the years, Hambourg seems a figure from a distant past. Part of this is certainly due to the fact that while Moiseiwitsch recorded almost up to the time of his death in 1963, even leaving several stereo LP recordings, Hambourg, who predeceased him by only three years, made his last commercial 78 rpm disc in 1935. The present release couples the only two concerto recordings Hambourg made. The Tchaikovsky is of particular interest in that it has never appeared in an LP or CD transfer. The first electrical recording of the work, it suffers from a too-distant recording perspective and some occasionally slapdash accompaniment (the first side in particular really should have been redone). But it preserves some Romantic-era touches that are simply not heard today, such as the octave-higher echoing Hambourg interpolates in the first movement cadenza (Track 4, 15:02 – 15:18) and the slow, dreamlike tempo in which the second movement waltz episode is taken (starting at 3:35 in Track 5). As neither recording came out on particularly quiet shellac, the sources used for the present transfers were British HMVs for the Beethoven and American Victor “Orthophonic” pressings for the Tchaikovsky. P.S. Mark added in an e-mail just prior to release: "For the demo track for the Hambourg, I was thinking that maybe the latter half of the second movement of the Tchaikovsky (Track 5, from 3:12 on to the end of the track) would be good, in that it highlights an approach to the middle section of the movement that I've heard in no other performance." *Although the orchestra was originally credited simply as "Symphony Orchestra", these sessions are listed in HMV’s contractual account with the LSO. To preserve the LSO’s “Red Label” status, recordings made in 1929-30 issued on the cheaper Plum Label concealed the orchestra’s identity. 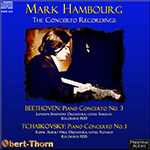 This valuable release couples Mark Hambourg’s only two concerto recordings (the Tchaikovsky from 1926, Beethoven from 1929). Much celebrated in his day, Hambourg has been largely forgotten (though his complete Liszt Hungarian Rhapsodies has been reissued on APR). Technically and aesthetically, his playing on these early electricals inhabits a very different world from contemporaries as varied as Rubinstein, Moiseiwitsch, Horowitz, Backhaus, and Schnabel, among others; despite living until 1960, in a sense his playing never really adapted to the 20th century. This disc offers a fascinating window into what even in its day was an anachronistic style of playing. In the Beethoven, his first solo entry commands attention in its extraordinary rhetorical freedom. Phrases are vividly sculpted, with a delicately supple spring to the touch, velvety with silver hues, and often with a pronounced desynchronization of the hands. His conception of the basic tempo is rhapsodically free (in the E♭-Major second subject, listen to his volatile scampering off, only to be sternly reined in by Sargent at the first opportunity!). Virtuoso passagework is vividly shaped but technically approximate and overpedaled, with much swallowing of detail. He opts for Moscheles’s flamboyantly anachronistic cadenza, which he lays into with thunderous abandon. In the Largo, his deep velvet pile is absolutely gorgeous, though the forte beginning disconcerts. The finale is a wild ride, with much technical approximation and a pronounced mannerism of “disappearing” phrasing (e.g., in the central A♭-Major episode). Sargent’s accompaniment is ever game and expert (he really earned his fee that day!). Comparisons are moot; though Hambourg’s penchant for snatched or swallowed phrasing is sometimes reminiscent of Schnabel, and his nuances of sound and touch can bring Moiseiwitsch to mind, the discipline and rigor of these artists is conspicuous by its absence. The Tchaikovsky has a wonderful idiomatic sweep, realized with a hair-raising degree of technical approximation: Some of the first-movement cadenza verges on unrecognizable. When not out of his league technically, he can play with exquisite lyricism, as in the second theme of the first movement. In the slow movement, the central Allegro vivace assai (bars 59 ff.) has great delicacy, and the subsequent waltz episode (bars 81 ff.) is radically conceived at a real waltz tempo instead of the usual breathless chase. The finale goes with a headlong dash that is undeniably exciting if you can overlook such a casual indifference to the right notes. Altogether a unique experience, of an entirely different kind from other early electrical classics Solomon/Harty (1929, Naxos) and Rubinstein/Barbirolli (1932, RCA). Superb transfers from Mark Obert-Thorn. Essential listening for anyone with an interest in the history of piano interpretation.